In January 2013, the pair picked up the BBC Radio 2 Young Folk award. Following the award win, Russell and Algar toured the country in April and, after completing school and University Exams in May, began touring again at the beginning of June - a schedule which saw them play venues and festivals such as Cambridge Folk Festival and Fairport’s Cropredy Convention as well as appearing live on Mark Radcliffe’s BBC Radio 2 Folk Show. 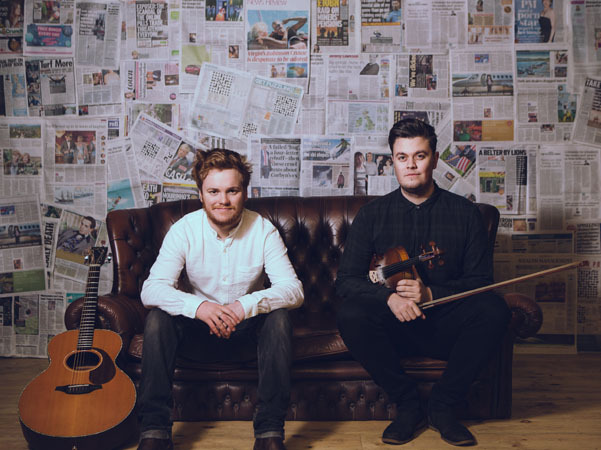 After recording their second album in the November of 2013, again with Fellside, Russell and Algar received the Horizon Award for Best breakthrough act at the 2014 BBC Radio 2 Folk Awards. The second album, The Call, was then released in July receiving 5 Stars in fRoots, 4 Stars in both R2 Magazine and The Telegraph and a host of other brilliant reviews, Bright Young Folk describing it as an “outstanding show of maturity” with “enormous promise”. In 2015 the duo were nominated for Best Duo at the Folk Awards and followed that with a full year of touring the UK and Europe. The released their third album, 'The Silent Majority', in March 2016. The duo come from musical households and both began to develop their musical skills long before joining forces. Algar, originally a member of TRI became All Ireland Champion, and All Britain Champion on numerous occasions before the age of 16 and Russell had begun a career as a solo musician supporting acts such as Karine Polwart and Lau, amongst others.